Do you love pushing the limits of modern mechanics? If so, you’ll probably love RV triple towing. Just because many states allow it, does that mean it’s safe? Take a closer look to find out if this toy-hauling method is right for you. While commercial truckers call it “hauling doubles,” RVers call it “triple towing” (sometimes “double towing”). You’ll know it when you see a vehicle pulling two trailers, usually a fifth wheel and a utility trailer. 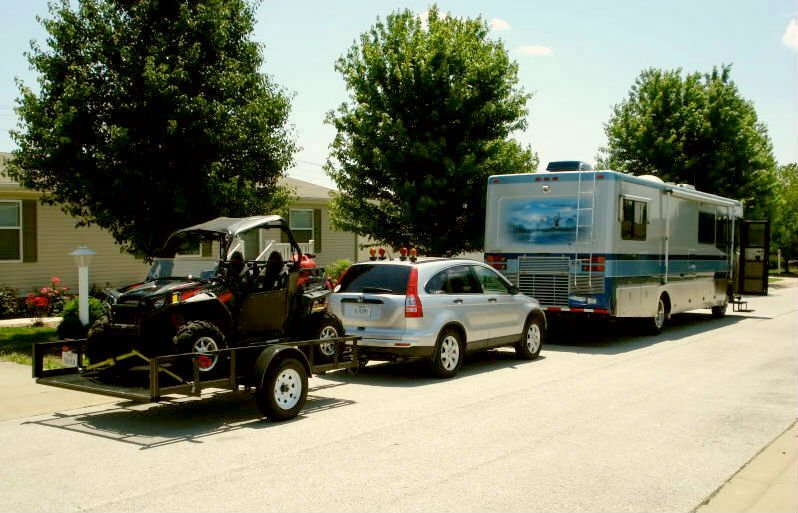 Additionally, RVers often tow boats or ATVs behind the first trailer. 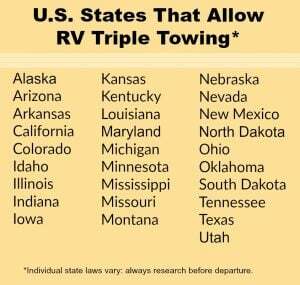 RV triple towing is illegal in most states along the East Coast. However, in the wide-open West where it’s not prohibited in most states, you’ll see RVers doing it from the Pacific Ocean to Colorado’s highest peaks and beyond. When you see triple towers on the road, consider moving out of the way. Heavy truck crash expert Doug Rowland explains why. “For commercial drivers desiring to haul two or more trailers, additional education and training are required. Most states require a separate endorsement on the driver’s license before a driver can haul doubles or triples. There is no such requirement for non-commercial towing,” says the associate from Robson Forensic, a consulting firm providing the technical expertise needed to resolve litigation and insurance claims. What’s the difference between a bus and an RV? “Take a single 45-foot, 102-inch wide and 12-foot high vehicle, powered by a rear-mounted diesel. Install seating for more than 15 people and it’s classified as a bus, a commercial motor vehicle. As such, its operator must be a trained professional, required to maintain a valid commercial drivers license (see above) including an endorsement for passenger carrying. Now, take the same exact vehicle, by the same manufacturer, and install a kitchenette, beds, cabinets, bathroom and more. Its classified as an RV and requires no special education, training or experience to legally operate. Is it legal? Yes! Is it safe ? It can be or possibly not, depending on the driver. Are my combined weight and towing capacity within safe and reasonable limits? You’ll find the answer if you read towing guidelines in your owner’s manual. Do I have enough driving experience? Many variables play into routine RV driving under normal conditions. For instance, if bad weather or an RV tire blowout occurs while you’re RV triple towing, do you know exactly what to do? If you’ve answered yes to these questions and still want to proceed, do your research. You’ll see that state laws for non-commercial triple towing drivers are often vague. For instance, some state vehicle codes clearly say “triple towing allowed,” while others simply give a maximum combined length for the setup. Here’s another perfect example of how laws vary. Let’s say you’re driving through Nebraska, Illinois, and Indiana. RV triple towing is legal in all three states, but look closely at each state’s vehicle code. How will you travel through three states with conflicting requirements? NEBRASKA: Maximum RV width 102 in. ; maximum motorhome length 45 ft.; maximum RV height 14.5 ft.; maximum combined length for two- or three-vehicle combination 65 ft.
ILLINOIS: Maximum RV width 102 in. (some roads 96 in. ); maximum motorhome length 45 ft.; maximum trailer length 53 ft.; maximum RV height 13.5 ft.; maximum combined length of two- or three-vehicle combination (with fifth-wheel trailer only) 60 ft. Subsequently, the only way to know exactly what you need to comply with the law is to research RV towing laws for every state you’ll visit. Begin your investigation by visiting each state department of transportation’s website where you’ll travel. As a result, you may find that RV triple towing isn’t worth the pre-trip hassle, risk, driving stress or that it’s too great a mechanical burden on your primary tow vehicle. Keep in mind that there are other choices such as renting outdoor toy rentals at your destination or if you’re a water enthusiast, there are new outboard-powered inflatables available on the market that you can easily fit in an RV. Nonetheless, after learning about all of the aspects of triple towing, you may or may not find that it fits into your camping lifestyle. Please double check California as a state that allows RV Triple Towing with out a license upgrade. Under Caltrans section 12804.9(B) requires an examination for a Class A license “any vehicle towing more than one vehicle”. A commercial driver needs an endorsement to operate (1) A double trailer. Yes, California does require a special driver’s license endorsement to drive any trailers over 10,000 lbs or RVs over 40′-feet long. California is a gnatsass away from being a totalitarian dictatorship. California is already that way. Need to proofread/fact check a little better. The article only lists 4 states where it is illegal. Then there is a chart where it is allowed- but it only shows 28 states, one if which is a state previously stated it was illegal in. Thanks Rpo72, you’re right, it was confusing. Edit made. Thanks for pointing it out. Frankly, it should not matter whether or not you carry more than 15 passengers to require licensing for RV’s and towing “triple”. It should be based on weight and length. I see far too many RV drivers who are unsafe, and have little to no knowledge on how to handle a 40′ Class A, or a 40′ Fifth wheel, towing a boat, or a toad. Might upset the 80 year old accountant, who never drove anything bigger than his Mercedes sedan in his life, but,, the safety of all people on the road is paramount. Absolutely right! We all know some drivers who have no clue about driving a big rig, or towing something. There are classes available for the newbies but unfortunately no one is required to take any training. Too bad, it would surely not be too tough to afford $50 to take a class if you can afford the $$ thousands to buy an RV. Come on Insurance companies, you guys could control this by requiring certification of training. Well….. I can’t speak for other RV drivers, but the fella that owns the rig in that picture is highly skilled in driving that rig and actually had a CDL over 20 years. 🙂 Now lets talk about those trained professional commercial drivers that spend more time on the cell phone than the steering wheel…….. those are the guys you watch out for on the highway, and the percentages are getting higher every day. Hey there Adam Ant Its a 700 dollar fine for talking on a cell phone with anything but a hands free set up. I kinda doubt your seeing as many truck drivers doing that as you say. Actually the fine for a CDL driver talking on a cell phone without a Bluetooth device is up to $2850.00 and the company they drive for can be fined up to $11,000.00 per incident. And in the state of Georgia it is illegal for all drivers to use a cellphone without a Bluetooth device or to be texting, even if they are stopped at a traffic light. The only legal place for a driver to talk on a cellphone in Georgia is when their vehicle is parked in a parking lot or their driveway before they begin driving. Been triple towing for over 45 years and have had some bad experiences. but that’s the only way one can sometimes take all the toys along.. Had a hitch on the rear of a Montana fifth wheel break one time and fortunately only sheered off a sign post.,. It gets hairy in heavy traffic but such is life. Then perhaps maybe leaving a few of those “toys” at home would be a better decision. I would think that safe towing would be a more important aspect to RV’ing than figuring out how to carry of of those “toys”!